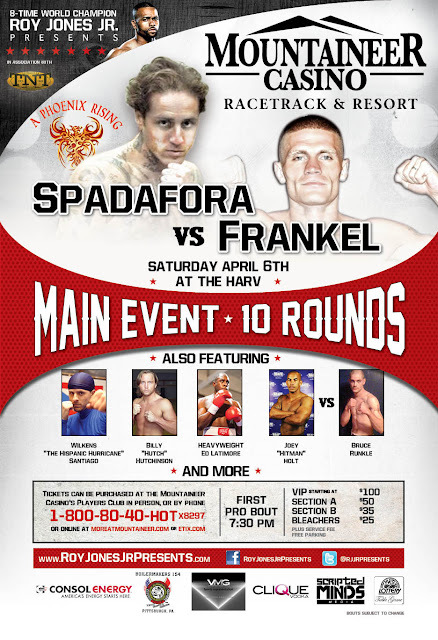 On Saturday, April 6, 2013, Paul "The Pittsburgh Kid" Spadafora (47-0-1, 19 KO's) steps back into the ring at the Mountaineer Casino, Racetrack and Resort in Chester, West Virginia to face-off against Robert "Red Hot" Frankel (32-12-1, 6 KO's) in a ten-rounder, as he continues his quest to fight for another world title. 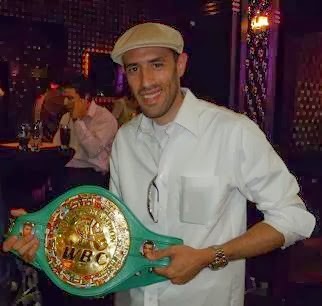 The Harv has been home to twelve of Spadafora's professional fights, including the night he captured the IBF Lightweight title, defeating Israel "Pito" Cardona on August 20, 1999. The Spadafora - Frankel bout headlines a card put forth by future hall of famer, Roy Jones, Jr., and TNT Promotions. Spadafora, 37, soundly outclassed Solomon Egberime in his last outing. Spadafora fought twice in 2012, and is staying extremely active by boxing in what will be his third bout in eight months. A winner in four of his last five contests, Frankel, 32, aims to upset the former southpaw world champion. In addition, unbeaten light middleweight pupil Joey "Hitman" Holt (2-0, 2 KO's) takes on Bruce Runkle (3-2-1) in a four-round battle. Also exhibiting their highly competitive skills in a pair of six-round clashes will be 24-year-old light welterweight prospect Bill "The Boilermaker" Hutchinson (5-1-2, 3 KO's), and undefeated middleweight Wilkins "The Hispanic Hurricane" Santiago (7-0, 1 KO). Plus, heavyweight newcomer Ed Latimore (1-0, 1 KO) fights in a scheduled four-rounder. More fights will be announced shortly. Base ticket prices are VIP starting at $100, Section A $50, Section B $35 and Bleachers $25 plus service fee. Tickets can be purchased at Mountaineer Casino's Players Club in person or by calling 1-800-80-40-HOT x8297 or online at www.MOREatMountaineer.com or www.Etix.com. Free parking. 1st pro bout 7:30 P.M. Bouts subject to change. If you can't attend this exceptional card, you can purchase the event live via GoFightLive by clicking the link.